Muda : Western Obsession for recipes and The five why`s technique. Western Obsession for recipes and The five why`s technique. These days I have thought a lot about how western culture seems to be seeking recipes for success in all areas. In general we all look to follow a method, a scientific way to find solutions, to find success, to achieve what companies such as Toyota has in almost a century of making cars. I guess that`s why people in general is a fan of Checklists. Speaking of which, I will be reviewing The Checklist Manifesto by Dr. Atul Gawande in a future post. But anyway. I believe we like this tools because we believe it is a safe way to go into the wild. To reduce risks, and to maximize the chances of success. This is no trivial because this obsession I believe, lead Motorola & GE to develop the well know 6 sigma methodology. I have no evidence to support this last statement but I believe that`s why 6 Sigma was born on this side of the planet, well a little bit up North. 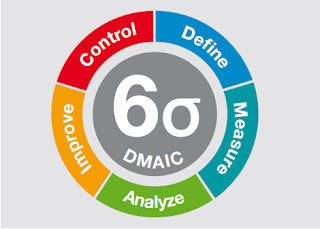 But as the next article about Six Sigma in Asia sort of explains, difference between Western and Asian Cultures are noticeable. Lean on the other hand, comes (as we all know) from Japan, born within the walls of Toyota and to my eyes, Lean is first about people and principles, and when followed and applied, derive in efficient tools that can be apply to a wide range of situations. I believe that cultural difference were significant and were crucial when the first western learners took these information and export them into the US. Of course language was the greatest barrier to fully understand the principles and tools from Toyota. But I think that it was also the obsession to have a recipe for success, which lead to receive some sort of distorted tools and lack of understanding of principles. Fortunately there are leaders such as Mark Graban, Steven Spear, Karen Martin, John Shook, and many others that have helped to clarify and expand the knowledge across industries. All this introduction is to support the following story. I was recently working with a crew making a root cause analysis. Claims have been high for the past weeks and we wanted to know why. It is a requirement that the root cause analysis would be conducted through a Fishbone diagram, a 5 whys technique or both. I prefer other techniques or tools since I believe this could be biased if these tools aren´t supported by evidence. I will explain later why. In this sense, I have always asked myself, how did the creator of the 5 whys defined that 5 were enough? Why asking why and not when, how, who, and others? 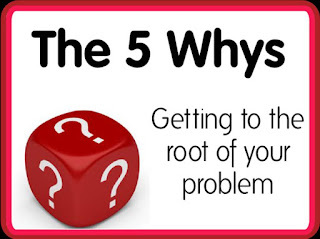 And why corporations are so emphatic to specifically use 5 whys only? I believe this tool didn´t captured correctly the spirit of improvement, when first brought to America. The key point here is to dive into the issue and asking why, accompanied by who, when, how, how many etc. Of course, also having facts, and/or data. Understand the problem is the main idea. During the session to capture ideas and define what was the root cause, I didn´t use the 5 whys as the company demands. Instead, requested evidence, data, facts and it was more like a dialogue. A discussion with the team members, to understand the underlying issue causing all of the symptoms. I guess we did a pretty good job, and more important is that people got involved. My personal conclusions are that sometimes you got to use the tool that fits better the problem you`re facing. Or as the Lean practitioners say, according to the problem that you`re trying to solve. Why do I think these tools could be biased? On the same exercise, one of the team members pointed out the valid fact that we had new personnel and if training was´t complete and properly executed of course quality would decrease. We have an unusual high rotation, influenced by a number of different factors. So we dived on the lack of training of new personnel. Everybody agreed that it would be an issue. But is it an issue today? not sure. One of the supervisors said, "I think it does´t have anything to do. We know our training isn´t the best but is not the main issue right now". Lets conduct a 5 whys before knowing how the story ends. Lack of training on new personnel. Why? Because there isn´t enough time to train. Why? Because our supervisors are in a hurry. Why? Because they need the job done. Why? Because they don´t like to give explanations. Why? Because they may be under evaluated. So the problem is originated by the trimestral evaluations right? But wait, what if we dive a little bit? What if the issue isn´t due to the evaluations? The issue must be due to the training program right? Ok, will see what the 5 whys reveal. Why? Because the training program isn´t properly designed. Why? Because it was designed by HR. Why? Because no operator or supervisor was involved. Why? Because they were busy. Why? because they didn´t have time. Why? Because needed to get the jobs done. Wow! this tool is really efficient right?. Both analysis lead to the semestral evaluation. So if we wanted to fix this issue, all we have to do is get rid of the semestral evaluations. That would have been the answer if we didn´t have evidence. Note that I just conducted this analysis just with assumptions. The action on eliminating the semestral evaluations would have an effect on the organization. No doubt about it, but I`m not sure that would have an impact on claims. "Because the people with higher mistakes, are experienced people and relatively new people, look". And showed his graph were it was clear that something in the process apart from training, was causing the claims. But the evidence suggested that training, even though, might be susceptible of improvement was´t the primary source of variation creating claims. Everybody agreed and we moved on to the next possible cause. Thank`s for reading. If you liked this post, please share. If you do not agree with me, please share some knowledge. If you didn´t like it, please tell me why. That´s how we can improve.